This is the month of Thanks-Giving – so, who have you thanked lately? Giving thanks to others benefits the recipient of the good wishes, of course, but it also benefits the giver by manifesting more reasons to be thankful. 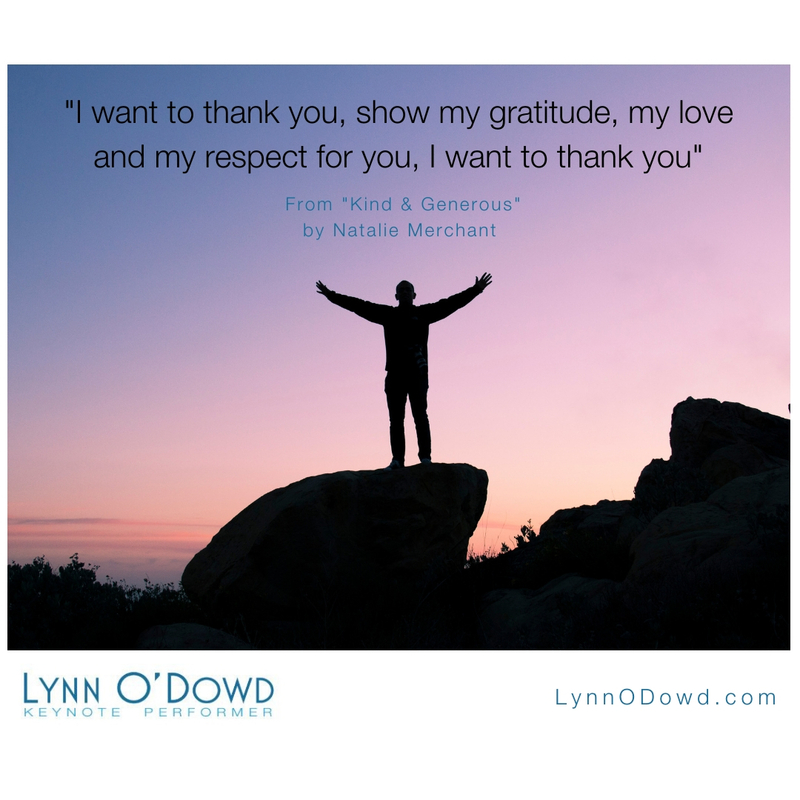 The obvious benefit is that saying “thank you” leads to better relationships and promotes personal bonding. But there’s more to it: Research shows that gratitude has many health benefits as well: less stress, more energy, lower blood pressure, and a stronger immune system, to name a few. It can even slow down aging. Now that’s something to be grateful for! In my previous life in the corporate world, I had a boss I really admired. I always felt extremely fortunate to work with him. Not only did he take the time to mentor me professionally, but he always went out of his way to thank me for my help when we worked on projects together. He didn’t have to do that; it was my job, after all, but he made me feel like a valuable member of the company. When he passed away a few years ago, his wife asked me to say a few words at his memorial service. I also performed the song below at that service, taking the opportunity to thank him through my tears. I wish I’d thanked him sooner. I told his family afterward that I had never expressed my gratitude to him personally. I never told him how much I appreciated working with him, or thanked him in the heartfelt way I wanted to. That’s a regret I will always have. It’s important to be grateful for the big and small blessings in your life, but also remember to look for ways to show family, friends, colleagues, and clients that they are important to you. Don’t make my mistake. Thank people for being there for you, in the moment – for their sake and for yours. Are you booking speakers for your group or meeting? After not singing for 35 years, – in a moment of madness – I answered an ad to be a singer in a Rock’n’Roll band… and got the gig. I share my story about how stepping out of my comfort zone and getting a little outrageous has changed my life.